If you are hoping to plant veggies in your school garden that can be harvested by summer break but think you’ve run out of time: fear not! There is still a window for planting lettuce, radishes, peas and even nasturtiums – enough for a tasty harvest salad in the last week of school. And of course microgreens can be started anytime and will be ready to nibble in a week or so…kids really do love these. The last frost date in our area is typically around April 25, meaning that this is a good time to direct sow seeds outdoors. I have some great lesson plans and ideas for garden planning and planting, so let me know if you’d like me to come and work with you and your class. I provide supplies and sessions are around 1-2 hours, depending on the grade level and what you’d like to achieve. Here are some pics from recent workshops at Henderson and Kelly Creek schools. 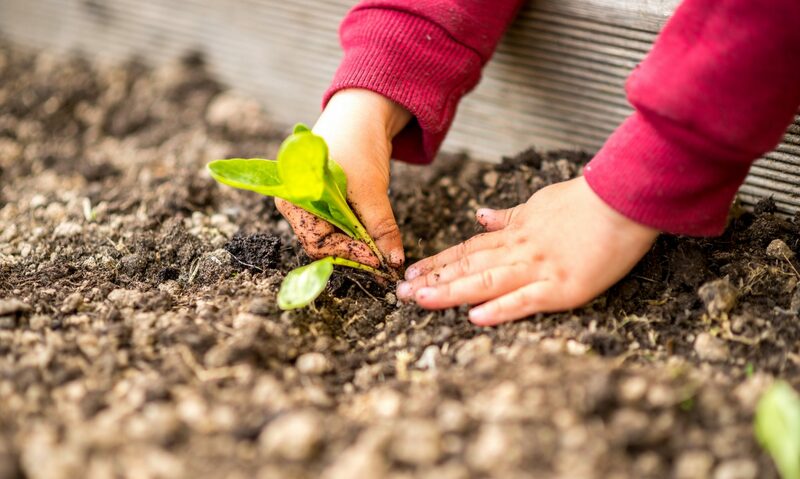 A month by month guide for school gardening in Powell River is now available for you to use, just in time for the planting season. The guide provides you with indoor and outdoor food-growing related activities for every month of the school year, taking the guess-work and intimidation out of making the most of your school garden. Download as many copies as you need here. A new School Food Literacy Program! In September 2018, the School District created a new program to support and expand the great work being done in local schools to educate our children about where their food comes from, and empower them to make healthy food choices in their lives. Teaching and learning activities are at the heart of a school’s efforts to develop food literate students that have the knowledge, skills and attitudes necessary to choose, grow, prepare and enjoy food to support one’s health, community, and the environment. Opportunities to foster food literacy and develop food skills exist in the classroom across curriculum areas, and are strengthened by hands-on learning in gardens, kitchens, local farms and in the community. Programs, both during and outside of school, that teach healthy eating are complemented by efforts to build food skills such as cooking, label-reading, grocery shopping and growing food. Here in Powell River, with our strong tradition of backyard vegetable growing and an expanding farming community, there is an emphasis on using school gardens and local farms as outdoor classrooms for creative, experiential learning. The Food Literacy Coordinator is currently working with schools to ensure all school gardens are thriving places where students and teachers can work alongside parents and other community members in a pleasant and rewarding environment. These partnerships support schools in achieving their food literacy goals and provide opportunities for communities to be involved in supporting a comprehensive school health approach to food literacy at a local level. These partners may include community organizations, farmers, health professionals, municipalities, and others. A local example is the relationship between the Food Literacy Program and local garden shop, Mother Nature. Not only does MN provide generous discounts on things like seeds and micro-green growing equipment for schools, they also consult with us on using these supplies as educational tools in gardens and classrooms. Another example is the educational partnership currently being developed between the Texada Food Hub and SD 47, which will result in a pilot program of food preservation workshops for Grades 3-7 students being offered in 2019. School food policies are developed at both the school and district level, and support healthy food environments, increase access to healthy food and support healthy eating and food literacy initiatives at school. Schools can work with all stakeholders across the school community, including students and parents, to create a whole school food policy that reinforces all other aspects of a comprehensive school health approach to food literacy by expressing a common vision encouraging all aspects of food to be brought together, clearly, coherently and consistently. School food policies can address the sale of unhealthy food, school garden policies, local procurement of fresh food, classroom celebrations and many other aspects of the school environment. An example of this at the local level is collaboration between the Food Literacy Coordinator and Brooks High School students on a School Health Committee project to influence the food culture at the school, so that students have the knowledge and the options to make healthier choices. This will include surveying students as to the kinds of foods they’d like to see offered in vending machines and at the cafeteria, and working with the Culinary Arts program to develop some healthier lunch options. The School Food Literacy Program aims to provide SD47 students with the knowledge and skills to make healthy food choices – for themselves, their community and the environment.